*All promos and discounts will be applied during registration. The Field Player Positional Training affords every camper to get 3 additional position specific sessions filled with repetitions at either the Forward, Midfield or Back positions. Ball Striking, Finishing, Short to Long Range Passing, Defensive Footwork, Position Specific Fitness & Stretching, 1 v. 1 Attacking & Defending are just some of the additional repetitions that each player will receive. The Field Player Positional Training is available for the following camps: Nike Showcase, Villanova College Bound ID, Junior Elite Overnight, and Youth Day Camp. Remember, during the camp week, every player will have the opportunity to have at least 2 training sessions with a College Coach (2 training sessions for Nike Showcase Camps, three training sessions at College Bound ID Camp). FIELD PLAYER SPECIFIC TRAINING can be purchased when you register for camp. The Additional Goalkeeper Training affords every camper the opportunity to get 3 additional position specific sessions filled with GK repetitions. ...are just some of the additional repetitions that each player will receive. The GK Positional Training is available for the following camps: Nike Showcase, Villanova College Bound ID, Junior Elite Overnight, and Youth Day Camp. Remember, during the camp week, every Goalkeeper will have the opportunity to have at least 2 training sessions with a College GK Coach (2 training sessions for Nike Showcase Camps, three training sessions at College Bound ID Camp). ALL Games on Villanova Football Stadium & Higgins Complex are livestreamed and recorded. Games played at Radnor High School or any of the grass field on campus are not livestreamed. All parents will receive a code to access live streaming through Facebook during the camp in order to watch their camper play. Teams are welcome to register for any of our events. Please contact us by email at info@vusoccer.com with the subject line of “Team Discount” to learn more about the team registration portal. We serve the needs of soccer players from all levels. Technical Development. Comfort with the ball. Villanova University was founded in 1842 with a shared commitment to the Augustinian ideals of truth, unity and love; and a community dedicated to service to others. The strength of the Villanova experience comes in part from the University’s welcoming community. All members are bonded together by a shared responsibility to let the principles of truth, unity and love guide their lives. The Villanova community helps student-athletes grow intellectually, professionally and spiritually, and challenges them to reach their full potential. Our summer camps are an extension of the University’s strong mission. Because we have a passion for the strong bond of our community and the individual’s pursuit of knowledge and learning on how to do things the right way within it, we put a strong emphasis on the values/life lessons learned by being a part of the game. Respect the rules of the game and others. A strong work ethic is at the core of a young soccer players’ future. Having the ability to work through challenges and adversity is an important skillset to learn at an early age. 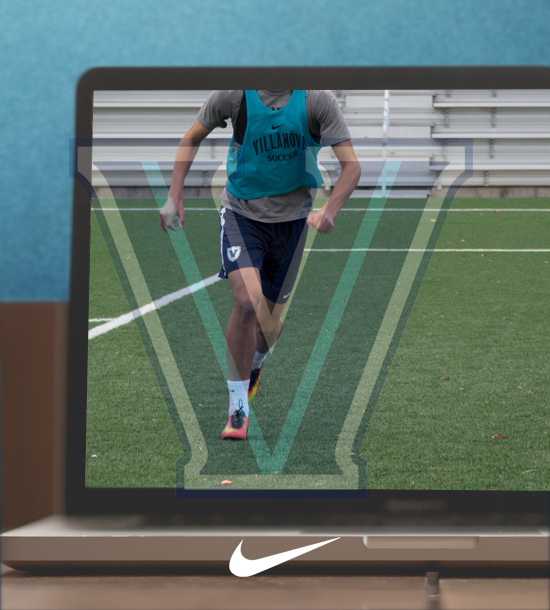 Villanova soccer puts a strong emphasis on challenging players on the field with a time demanding yet fun curriculum that focuses on areas of the game that players can control through hard work. Ability to feel good about working hard for your teammates and coaches. Ability to stay focused throughout the transitions of the game. Ability to turning misses into makes. 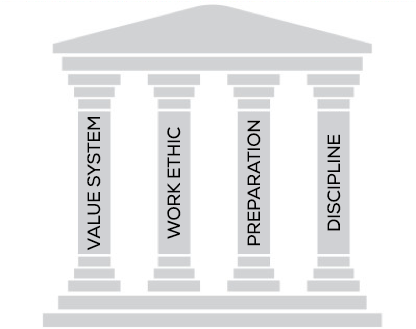 Ability to value the skillset of hustle. Ability to try your best. Technical repetitions. Dribbling, Passing, Receiving, Finishing. Agility, Balance, Coordination. ABC’s of the physical part of the game. Equal emphasis on the attacking and defensive side of the ball. Teaching the skillsets needed for specific positions. Confidence in themselves to carry out the skillset of their position. Work ethic when coaches and others are not looking. Thank you so much for all your help with camp this year Coach, I appreciate all the effort you put in for me and my experience. I had a great experience and am now in contact with a few schools based on my performance. Best of luck for your tour in Europe, and for the rest of the season! I will be watching you guys as much as possible and Mum will be rooting for you as well. Thank you for a great camp this year. The camp was fantastic and I had a great time. It made a huge difference to be able to be seen by so many coaches with teammates that I’m comfortable playing with. Not only was it great to showcase for these coaches, but it helped us prepare for our upcoming high school season. We totally felt the experience of being a Villanova Soccer player. I'm writing to say thank you for holding the college soccer ID camp on October 29th. I appreciate spending time at Nova and for your evaluation of me. I will take time to improve on the areas that I did not receive higher marks. Also, thank you for going over the college soccer recruiting process as it answered many questions I had about it. The rain was a challenge at first but once we were all on the field, I just enjoyed the sport. As a junior, I want to come back to whenever you hold your next camp. Again, thank you for a great experience and a great day of soccer. I just wanted to take the time to thank you for all the insight that you gave in your Champion's Mindset talk. I loved to see how passionate you are about the Villanova Soccer program. I also value the great relationship that you have with your team. It is easy to tell that there is a mutual trust you have with your team while maintaining a close relationship. I also got a lot out of your talk and learned a lot about how all the pieces of a championship team (and a champion) fit together. Your college ID camp was incredibly well organized and a great experience for our camper, and his other teammates from Dubai. Thanks again for your superb hospitality at your campus and camp, you are all first class in every regard. We hope to see you in Dubai soon! Click on the link here for IMPORTANT DOCUMENTS regarding the upcoming camps. What is the difference between Junior Elite & Youth Elite? Twilight (8:30am-8:30pm) Camps & Residential Camps for this age group. Youth Elite is for 1st to 4th Graders. We offer 9-12 noon or 9-3pm Day Camps for this age group. What Does Residential Camper mean? What Does Twilight mean? Twilight Campers will arrive at the end of check-in on the 1st day and stay until the camp ends at 8;30pm. On the 2nd & 3rd days of camp, Twilight Campers will arrive before the first session & depart after the last session, which is generally around 8:30am to 8:30pm. Twilight Campers only eat lunch & dinner on these days. On the 4th day, Twilight Campers arrive before the first session and leave after closing ceremonies around 12 noon. Times will vary by 30 to 45 minutes per the schedule of the week. Can I register my club or high school team and receive a team discount? 5-6 players from same team/club, each player will receive $59 discount. 7-10 players from same team, each player will receive a $79 discount. 11 or more players from the same team, each player will receive a $99 discount. 11 players from the same team, each player will a $25 discount. Complete the online registration. (Links provided on the homepage and the 'Camps' page.) Be sure to supply all requested information and to acknowledge the medical and concussion waiver with your signature. Please make sure the email you register with is the email you check MOST frequently. Can I register with a deposit? Yes. During the registration process, click the 'Deposit.' option. PLEASE REMEMBER to keep your confirmation email with the link to pay the balance due. One month prior to the start of camp, please use this link to pay the remaining balance. What happends next after I register for camp? After you register, you will receive one important document called the Exhibit C Form, which has to be signed and if under 18 years of age, signed by a parent as well. A hard copy of the Exhibit C form must be submitted at check in. Use of Villanova field space is prohibited unless the Exhibit C is submitted. After you register, you will receive two important documents. The first document is called the Exhibit C Form, which has to be signed and if under 18 years of age, signed by a parent as well. A hard copy of the Exhibit C form must be submitted at check in. Use of Villanova field space is prohibited unless the Exhibit C is submitted. The second document is called the arrival/departure sheet. A hard copy of this sheet must be submitted at check-in. It is a vital piece of information to ensure the safety of your child as they come and go from camp so it is mandatory for all campers to fill it out. Is transportation to camp provided? No. If you will be flying into Philadelphia airport and transportation is required, please email us for a recommended list of approved vendors. Otherwise, Uber is the cheapest and fastest form of transportation. The Camp Schedule will be posted under our important documents on the camp info page a week prior to the camp. The most up-to-date schedule will be handed out at check-in. Below is a typical schedule for our overnight camps. Residential Campers: Breakfast, lunch and dinner are included in the price of camp. Camper’s first meal will be dinner on Day 1, and last meal will be breakfast of Day 4. Remember, on Check-In Day, Dinner will be your first meal with campers so make sure to eat lunch on your own. Twilight Campers: Dinner on Day 1, Lunch & Dinner on Day 2 & 3 are included in the price of the camp. Remember, on Check-In Day, Dinner will be your first meal with campers so make sure to eat lunch on your own. Day Campers: 9-12 & 9-3 campers are expected to pack a lunch for camp, EXCEPT on the last day of camp where we will have a pizza party for the 9am -3pm campers. Residential Campers: Need to bring bed linens and pillow(s) for a standard twin bed, towels for extra showering, soap, shampoo, toothbrush/toothpaste. *IMPORTANT PLEASE NOTE – Residential Campers will be carrying bags and items you bring for the week from your car to the resident hall, which occasionally can be a lengthy walk so PACK LIGHT! Heavy items such as bulky coolers, fans, TV’s, are not recommended. ALL CAMPERS: Need to bring soccer spikes, running shoes/ indoor training shoes (in case of inclement weather), a soccer ball (if you did not purchase one from camp), sandals, rain gear, adequate clothing for 3 games/sessions per day (shirts, shorts, socks, guards), a water bottle and sunscreen. Is Water and Gatorade provided at the fields? Yes. Every field will have an unlimited supply of Water and Gatorade provided for every camper. Yes. All campers need to bring a soccer ball. Villanova Camp Soccer Balls are available for purchase during registration & check-in. All Campers should bring cash for additional food, beverage, snacks & LIMITED EDITION clothing purchases from the camp store. During check-in, RESIDENTIAL & TWILIGHT CAMPERS ONLY (or parents) will have the option to add cash to a camp bank. Each time the camper makes a purchase; we deduct it from the balance. This way camper will not have to carry around cash. At the end of camp, the remaining Camp Bank balance will be refunded to the credit or debit card used during registration. When Is Registration, Check-In/Check Out, Closing Ceremonies? Residential Campers: Registration & Opening Ceremonies immediately following are generally during the afternoon of the 1st day (Typically between noon to 3pm). See Sample Schedule! Check Out will usually follow Closing Ceremonies typically help between 11m to 12 noon unless we inform you otherwise per changes by Villanova Conference Services. Twilight Campers: Registration & Opening Ceremonies immediately following will happen at the end of the Residential Campers Check-In designated times. See Sample Schedule! Check Out will follow Closing Ceremonies on the last day typically held around 11am to 12 noon. See Sample Schedule! Twilight campers must sign in and sign out at the Camp Store each day. On the 2nd & 3rd day, Twilight Campers can expect to be at camp approximately from 9am to 9pm. Day Campers (9am-12noon & 9am-3pm): Registration will be from 8:30am-9am every day. Opening remarks will take place at 9:05 am on a daily basis at a designated location. We will notify you about the location one week prior to the camp. It typically will be in front of a resident hall on South or Main Campus or the fields at the Football Stadium, Higgins Complex, or Radnor High School. Registration & Check-In for Day Camps at Radnor High School will be held in the area between the two fields. Are parents invited to attend? Parents are encouraged to attend the Check-In, Opening Ceremonies, Check-Out, & Closing Ceremonies. Additionally, parents are invited to watch the training sessions & games. However, parents are prohibited from coaching or having significant contact with any campers other than their son or daughter per the PA State Law unless proper Background Checks are submitted to our staff. 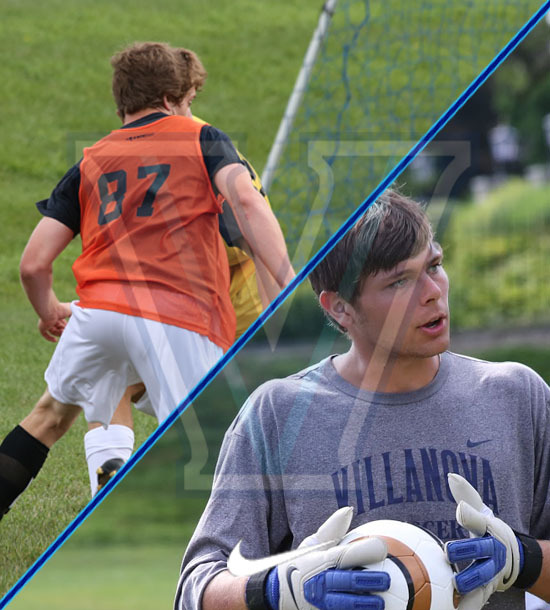 Most Coach’s & Counselor’s at the Villanova Camps are affiliated with Villanova University Soccer &/or other local D1, D2, D3 Universities/Colleges. Some local Club Coaches will work the camp. Background Checks per PA State Law will be required from ALL Coaches who are employed by Villanova Soccer Camps. What is a Camp Store? What do they sell? The Camp Store offers Limited Edition Villanova Soccer merchandise (Jerseys, Sweatshirts, Long sleeve & Short sleeve T-Shirts, Shorts, Socks), snacks, drinks & late night food orders for the Residential & Twilight Campers (Pizza, Cheesesteaks, Wings, Hoagies, Wraps). The Camp Store is located in the resident hall where the campers will reside during the week. Campers should bring cash for incidental or merchandise purchases from the camp store. Is a Camp Bank Offered? Yes, but only for Residential & Twilight Campers. All Campers should bring cash for additional food, beverage, snacks & LIMITED EDITION clothing purchases from the camp store. But only Residential & Twilight Campers will have the option to add cash to a camp bank. Each time the camper makes a purchase; we deduct it from the balance. This way camper will not have to carry around cash. At the end of camp, the remaining Camp Bank balance will be refunded to the credit or debit card used during registration. Do You Live Stream Games? How much does it cost? Yes. We livestream ALL Games on Villanova Football Stadium & Higgins Complex. Games played at Radnor High School or any of the grass field on campus are not livestreamed. All parents will receive a code to access live streaming through Facebook during the camp in order to watch their camper play. 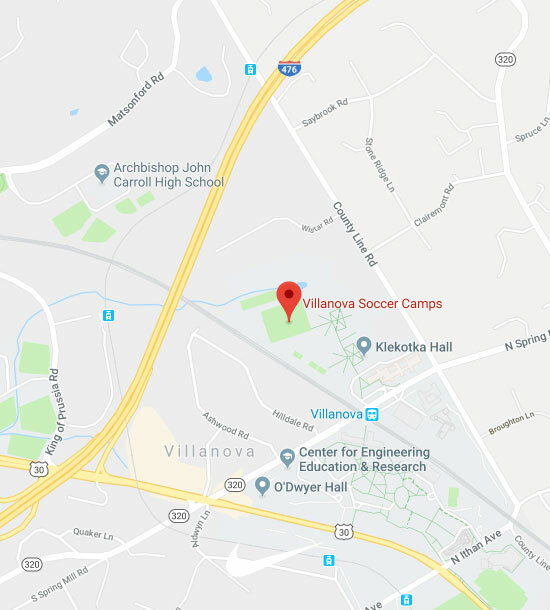 All Camps will be at the Villanova Football Stadium, Higgins Soccer Complex, Grass fields on Villanova’s Main Campus, and/or Radnor High School. South Campus Resident Halls (Caughlin, Good Counsel, McGuire, Stanford, St. Katharine, St. Monica) are on Ithan Ave., on the south side of Route 30 (Lancaster Ave). Parking for these halls are available directly on South Campus. Sullivan & Sheehan Resident Halls are in the middle of campus. Parking for these halls is available in the parking garage on Lancaster Ave. (directly across from Villanova's Football Stadium. The Football Stadium is directly on the corner of Route 30 (Lancaster Ave.) & Ithan Ave. You cannot miss it! The Higgins Soccer Complex is on Villanova’s West Campus on the corner of Spring Mill Road & County Line Road. Radnor High School is located at 130 King Of Prussia Road, Radnor, PA 19087. What is Villanova University's address? Villanova University’s address is: 800 Lancaster Ave Villanova, PA 19085. Keep in mind that this address will drop you to the middle of Lancaster Ave.
From 476. Take Route 30 (Lancaster Ave.) East. Than make a left at Route 320 (Spring Mill Road), which will take you North onto Spring Mill Road. West Campus will be on the left. Keep in mind, you have to turn right & go underneath the bridge to get to West Campus when coming from this direction. Yes. Parking is offered at Ithan Garage on the corner of Ithan Ave & Lancaster Ave. (Rt 30), which is directly across from Villanova’s Football Stadium. If you are staying on South Campus(Caughlin, Good Counsel, McGuire, Stanford, St. Katharine, St. Monica), you may try to find a spot briefly in the parking spaces on South Campus. For Radnor High School, parking is available next to the fields. Twilight Campers: Registration & Opening Ceremonies immediately following will happen at the end of the Residential Campers Check-In designated times. See Sample Schedule! Check Out will follow Closing Ceremonies on the last day typically help around 11am to 12 noon. See Sample Schedule! Day Campers (9am-12noon & 9am-3pm): Check-In will be from 8:30am-9am every day. Opening remarks will take place at 9:05 am on a daily basis at a designated location. We will notify you about the location one week prior to the camp. It typically will be in front of a resident hall on South or Main Campus or the fields at the Football Stadium, Higgins Complex or Radnor High School. See Directions to learn more. Check-Out will typically be held at 12:05 & 3:05pm on the field at the Villanova Football Stadium, Higgins Soccer Complex or Radnor High School. Information will be sent one week prior to camp about the location. The Football Stadium is directly on the corner of Route 30 (Lancaster Ave.) & Ithan Ave. Parking is available at the Parking Garage on Lancaster Ave. The Higgins Soccer Complex is on Villanova’s West Campus on the corner of Spring Mill Road & County Line Road. Parking is available on West Campus next to the fields. Radnor High School is located at 130 King Of Prussia Road, Radnor, PA 19087. Check-In will be help in the area between the two fields. What paperwork do I need to bring to Check-In? What else do I need to know about Check-In? On Check-In Day, Dinner will be your first meal with campers, so make sure to eat lunch on your own. Opening ceremonies will begin immediately following the Check-In so try to get to Check-In 30 minutes before the schedule has it ending. Yes. There are two campers to every room. Campers can request a roommate during online registration. All roommate requests need to be submitted no later than one month prior to the start of the event in order for us to accommodate. We do try our best to accommodate all requests. PLEASE only request a camper who is already registered and make sure to have discussed your request with the other camper. Can I stay in the resident halls on campus the night before camp if I arrive early? Can I choose my camp teammates? Yes, but there are no guarantees that we can accommodate every camper with this request as teams are put together per age and position. If your high school or club team sign up for camp together, we can guarantee that your team will be together. However, please email infor@vusoccer.com to request a team registration portal. Yes. Teams are welcome to register for any of our events. Please contact us by email at info@vusoccer.com with the subject line of “Team Discount” to learn more about the team registration portal. There is a $250 non-refundable fee for residential & twilight camps unless you purchase Camp Insurance. Camp Insurance will guarantee a refund of all money paid minus a $50 administration fee. For example, if you paid a deposit of $250 for the week of camp plus the $50 camp insurance fee than you cancel the day before the camp, you will receive a $200 refund. There is a $175 non-refundable fee for day camps unless you purchase Camp Insurance. Camp Insurance will guarantee a refund of all money paid minus a $25 administration fee. For example, if you paid a deposit of $175 for the week of camp plus the $50 camp insurance fee than you cancel the day before the camp, you will receive a $150 refund. What if a camper is injured before camp starts? A $250 non-refundable fee will still apply, however we will issue a $150 credit for future camp from the $250 fee. All injured campers must submit an explanation of the injury from a licensed physician before the 1st date of the camp. What is my child advances to the USYSA Regionals/Nationals and it conflicts with the camp dates? If your team makes USYSA Regionals/Nationals, ECNL Playoffs or USDA Playoffs/Nationals and the dates conflict with the Residential, Twilight or Day Camps, we will refund your money minus a $50 administrative fee, provided written notification with detailed playoff information is provided at least 10 days prior to the start of camp; otherwise there will be a $250/$175 cancellation fee. What if my child needs to take certain medications? During registration, parents/campers must inform the certified athletic trainer or coaching staff of any medications that the campers are taking. Parents should provide only the necessary doses of medication, which a camper is required to take during the duration of the camp. In accordance with Commonwealth of Pennsylvania laws and University policy certified athletic trainers cannot dispense, administer or hold on to any medications for campers. Campers will self-administer all medication. Campers should be comfortable with self-administering their medication in the proper doses and schedule. In emergency or urgent situations, athletic trainers are permitted to administer prescribed asthma inhalers and epi-pens, when necessary. Campers are encouraged and should carry all asthma medication inhalers and epi-pens with them at all times (field, dorms, dining hall, etc.) for the duration of the camp. If refrigeration is necessary for medication then there will be a secure refrigerator provided by the camp operators. A member of the athletic training staff will be present, or on site for the duration of registration to respond to any questions and/or concerns of parents and/or campers. What if my child has dietary requirements? Villanova University Dining Services deals with Dietary Requirements on a daily basis. The cafeteria staff will meet the needs of students with specific nutrition concerns or medically-restricted diets. In each dining hall there are a variety of soy products as well as lactose free milk available daily. Other special dietary items can be special ordered and kept on hand such as gluten-free cereals, muffins, waffles, bread, and wraps. Campers will need to be aware of their dietary concerns and follow their own specific diet. Have many International players attended camp? What countries have past international campers attended camp from? Will I be able to receive an invitation letter for visa purposes? Yes. 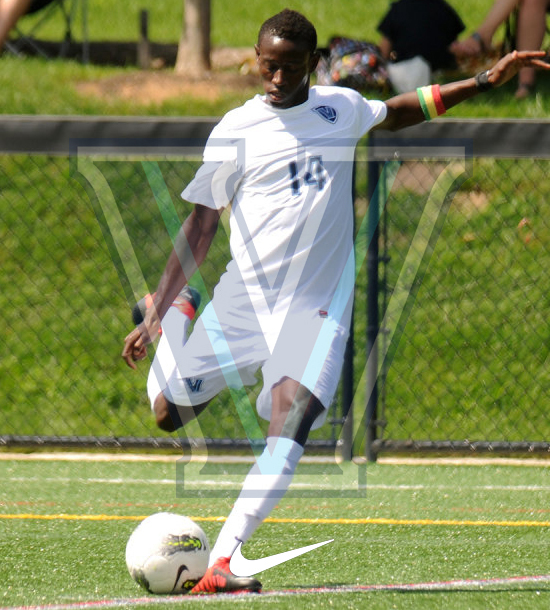 Following registration, please email us at info@vusoccer.com and we will send you an official camp invitation letter. ©2015 ALL RIGHT RESERVED. DESIGNED BY ARMS Software.